BLOOMINGTON – If Indiana has learned one lesson this year, it's this: winning basketball games is really hard when no one can make a 3-pointer. The Hoosiers demonstrated that again on Sunday, missing six straight shots from beyond the arc to start the second half and falling behind by as many as nine despite facing an Ohio State offense that was inept at best for most of the game. It was amazing how quickly the game changed when the Hoosiers finally began to knock down some 3-pointers. They erased the nine-point deficit in 1:33 and then went ahead on another 3 with 1:46 remaining. 1) Ohio State tied the game on a ridiculous deep 3 from C.J. Jackson as the shot clock wound down. It was a heave more than a shot. 2) Indiana turned the ball over off an inbounds pass after calling two timeouts to set up a play. 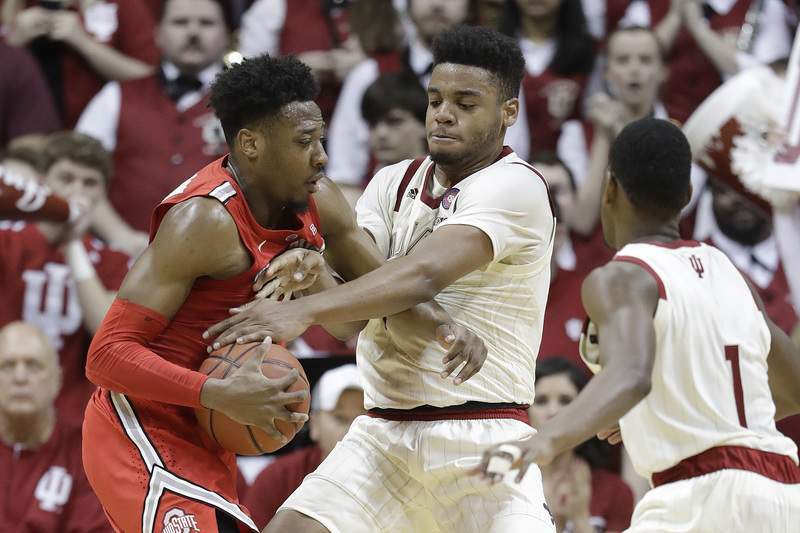 3) Ohio State ran a perfect pick-and-roll and Langford was a split second late in help, giving Andre Wesson a dunk. Even after all of that – and to be clear it was an incredibly disappointing stretch – the Hoosiers still could have won this game. Instead, Langford's potential go-ahead 3 rimmed around and out and the Hoosiers lost for the ninth time in 10 games. "Being able to finish the game comes down to execution," coach Archie Miller said. "It comes down to getting quality shots, being able to do that, and then you've got to find a way to rebound the ball at times, as well, and that was a big deal in tonight's game was just the rebound, the ability to rebound the ball. So many, five to seven, 50/50 long (rebounds), we have our hands on it and they take it from us, we have two guys go up for it, it goes out of bounds. Those are just back breakers." It was a microcosm of Indiana's season: flashes of brilliance, being in good position most of the afternoon and coming up short in the most important moments. Just like the Iowa game, this was one the Hoosiers should have won. They played well enough defensively to win, but just couldn't hit enough shots when the Buckeyes packed the lane and dared them to do so. This loss is absolutely devastating in terms of the Hoosiers' chances for the NCAA Tournament. They had two opportunities to pick up quality wins at home this week and came up short in both. The schedule is brutal the rest of the way and if something doesn't change drastically very soon, Indiana is headed for the NIT at best. The Hoosiers have had their chances, they just haven't capitalized. Really the only good news from the game was the continued improvement from Langford beyond the arc. He's hit three 3-pointers in three of the last four games after doing so just once in the first 20. He's also been more aggressive late in games, looking for his own shot and trying to take over when his team needs a basket. He needs to do that every time he's on the court, in my opinion. He's one of the best scorers in the Big Ten and when he takes the ball to the rim it's usually a good possession for Indiana. He can't defer anymore early; the Hoosiers can't afford it. Sunday was Indiana's 11th loss of the season. In Langford's four years at New Albany, his teams lost a total of 10 games. Still, by all accounts he remains the consummate teammate. "You're going to win some and lose some, but right now we're just trying to get back on track," Langford said. "We're taking it a day at a time, and I feel like us as a team, we're doing pretty well through this. None of us have our heads down. We're all just focusing on getting better each and every day to be better than we were the day before." It will be a major disappointment if Langford's only season in Bloomington ends without an NCAA Tournament bid. But it's not fair to blame him for this team falling short.